As you make the important decision about voting on Measure FF, please take into consideration that Million Trees and the Forest Action Brigade are not the only East Bay residents who plan to vote against Measure FF. Today we tell you more about why many East Bay voters have made that decision. Post-election update: Measure FF passed easily. In Alameda County 85% of voters approved Measure FF. In Contra Costa County 80% of voters approved Measure FF. These were the vote tallies on the day after the election, on November 7th. The East Bay Times published the following op-ed about Measure FF on October 4th. It was written by Peter Scott. He states his opposition to Measure FF clearly and emphatically. Emphasis and photo have been added. “Alameda County’s proposed Measure FF, East Bay Regional Park District Parcel Tax Renewal, appears innocent enough: improvements in area parks, safety, a 20-year continuation of a 2004 plan to enhance the public’s enjoyment of East Bay Regional Park District (EBRPD) properties. And the tax — a dollar a month per single-family residence and $69 a month for multifamily units in Alameda County — seems affordable. But wait: Half of the money raised by this measure would fund destruction of thousands of healthy, mature trees in the East Bay hills. This isn’t the first time this deforestation has been proposed. In 2013, FEMA offered a similar plan, to be implemented by UC Berkeley, the city of Oakland and the EBRPD. After the plan’s environmental impact was discussed in three public hearings, citizens responded with 13,000 written comments, which, by FEMA’s count, were 90 percent against the plan. and trees are the culprit and were the primary reason that the 1991 fire burned out of control. These statements are not only incorrect, they are the opposite of the truth. The old landscape burned regularly; the flame lengths of “native” brush and grasses are multiples of mature trees’ flame lengths and create conflagrations that fire personnel won’t fight because they spread and change direction so fast; the 1991 fire was a STRUCTURE fire, not a vegetation fire: houses set fire to trees, not the other way around. Factually, the ’91 fire was human-caused. First, it was a contractor’s construction debris fire that escaped into the brush; secondly, it was a reignition from embers that the Oakland Fire Department had failed to extinguish. The official report examining the causes doesn’t mention trees but does criticize the OFD’s failures in its incident command’s preparation, training and management during the fire. Of the 16 major fires in the hills since 1905, there are basically two categories: human-caused (10 fires) and “unknown cause” — it’s a safe bet most of those “unknowns” were also human-caused. If Measure FF is truly focused on fire risk mitigation, it would fund regular removal of fine fuels around the base of the trees — as EBMUD does so successfully — because it is the brush, grasses and debris on or near the ground that are most likely to ignite and are key to the fire’s spread and ferocity. Leave the tall trees alone, because they reduce wind, shade the ground, catch fog drip and discourage growth of flammable, weedy plants. If trees are not cut down, then repeated applications of herbicides to kill re-sprouts are unnecessary. No one is more knowledgeable about East Bay fire history and fire hazard mitigation than Peter Scott. He is a founding member of the Claremont Canyon Conservancy and the Hills Conservation Network. He is passionate about fire safety in the East Bay partly because of his personal loss. His home burned down in 1970 and 1991 and his mother was killed in the 1991 fire. Since 1991, he has made fire hazard mitigation one of his personal priorities. Peter Scott and his wife, Teresa Ferguson, instigated the Civil Grand Jury report about the ’91 fire. If approved by voters, Measure FF would simply continue existing Measure CC funding. Voters passed Measure CC in 2004 to provide local funding for park infrastructure, maintenance, safety, and services. Measure CC is a $12/year parcel tax that is set to expire in 2020. Measure FF is expected to raise approximately $3.3 million annually until it expires in 20 years. Measure CC boasts a long list of successful improvement to East Bay Regional Parks in areas of public safety, wildfire mitigation, healthy forest management, shoreline protection, environmental stewardship, habitat preservation, park infrastructure and maintenance, recreational and educational programming, and visitor services. While impacts of the Measure have been wide-ranging and largely celebrated, record California wildfires in 2018 have caused both opponents and proponents of the Measure to highlight the wildfire mitigation aspect of the program. Neither Measure CC nor Measure FF contains language that details how to approach reducing wildfires, however, Measure CC’s funds helped in developing the Wildfire Hazard Reduction and Resource Management Plan (“Plan”) that was approved in 2010 by the East Bay Regional Parks District (EBRPD) Board of Directors. Proponents state that passing Measure FF is critical to continue to reduce risk of wildfires along the wildland-urban interface. They accept that thinning of certain tree species and controlled use of herbicides are tools outlined in the Plan to accomplish the task. We are deeply grateful to the Green Party for their decision and we commend them for considering all sides of this complex issue, which is seldom done by political organizations. 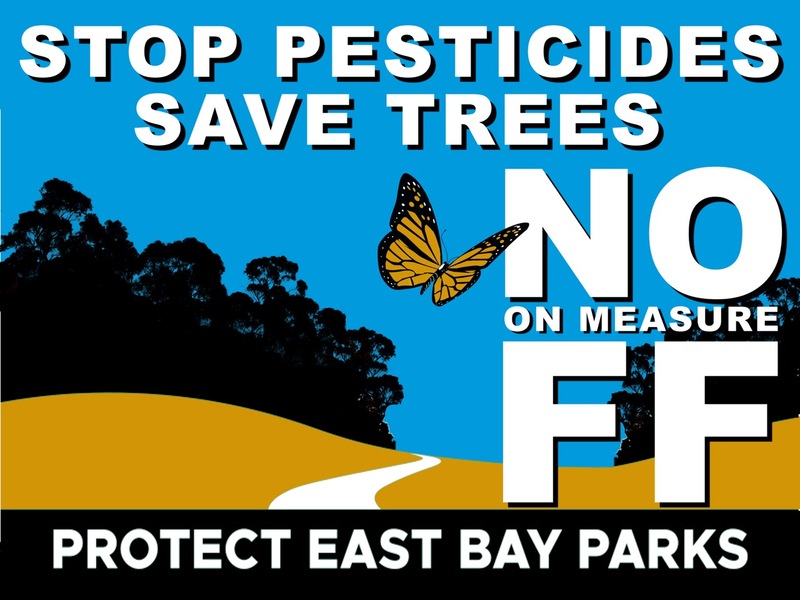 Whatever the outcome of this election, votes against Measure FF will deliver a clear message to the Park District: STOP destroying healthy trees and killing harmless plants and trees with dangerous pesticides!! This is the big, beautiful yard sign that you can put in your yard and neighborhood road medians in the East Bay. Peter Scott and the Green Party have delivered this message and you have the opportunity to add your voice by placing a yard sign in your own yard and in the road medians in your neighborhood in the East Bay. The Forest Action Brigade is offering yard signs at no cost to you. 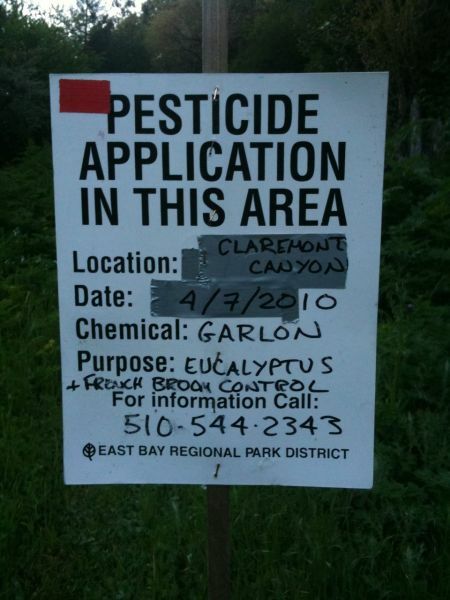 Request your yard sign by contacting the Forest Action Brigade: forestactionbrigade@gmail.com or call (510) 612-8566. ← Vote NO on Measure FF! !